During a run (or most any type of exercise) a sharp pain in your side known as a stitch can bring you up short. If you've ever experienced a side stitch, you know just how distracting it can be. And you're not alone: A 2015 study estimated that as many as 70 percent of runners had experienced a stitch—known medically as exercise-related transient abdominal pain (ETAP)—in the previous year and that during a race about one in five participants are likely to get a stitch during the competition. Fortunately, ETAP is not a medical emergency, or even a reason to see a doctor. And even though the cause (or causes) of side stitches aren't well understood, what is known is that most people can deal with one when it happens and then keep on running. 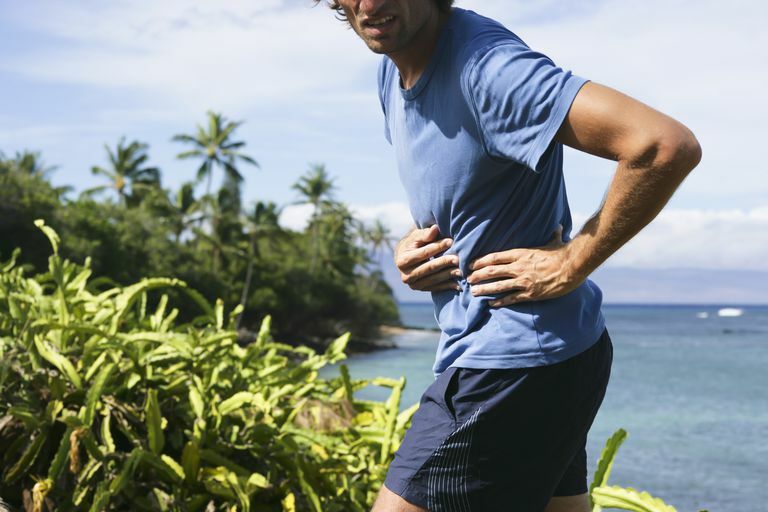 The overriding symptom of a stitch is localized pain on one side of the abdomen, usually just below the rib cage and on the right side twice as often as on the left in older people The opposite is true of younger runners. Studies show that people describe ETAP in different ways—as sharp or stabbing if severe and like a muscle cramp or pull when less intense. Going for a run too soon after eating. Some runners have noticed that they're more likely to get a stitch in the side if they're still full from a meal or snack. Not warming up before a run. This is another possible cause of side stitches that's based on reports from runners who say that if they start right in running without warming up they've noticed they're more likely to develop a side stitch. Drinking sweet beverages. Some research has shown that downing sugary drinks before exercise increases the likelihood of stitches. Having curvature of the spine (scoliosis). One study found a link between ETAP and increased curvature of the spine. Shallow breathing. This is theoretical; some experts attribute side stitches to improper breathing while running. Interestingly, a couple of popular hypotheses about the cause of side stitches haven't panned out. One is that drinking water or a sports drink while running can lead to ETAP but this doesn't seem to be the case. Stitches also are often attributed to muscle cramps, but at least one small study found there was no difference in electrical activity in the muscles when someone was experiencing ETAP. Next, try altering your breathing pattern: Take a deep breath in as quickly as you can, to force the diaphragm down. Hold your breath for a couple of seconds and then forcibly exhale through pursed lips. You also might try changing your breathing/striding pattern: If you always exhale when your right foot strikes the ground, try exhaling with the left foot strike. If all else fails, slow down to a brisk walk and concentrate on deep breathing. When the stitch goes away, go back to running. Age: Oddly enough, younger runners are more likely to get side stitches than are older folks. What's more, when older runners do develop ETAP, they tend to rate the pain (on a scale of one to 10), as less severe. Eating and drinking before a run: Not only does ingesting food or beverages before a run increase the risk of stitch, certain types of food and drink seem to be more highly associated with ETAP: those with a lot of sugar; high-fat foods; fruits and fruit juices; and dairy products. Stick to plain water for pre-hydration: Skip sugar-laden beverages, including sports drinks and especially carbonated ones. Regulate your breathing—it's the most effective way to prevent side stitches. Inhale and exhale through your mouth, breathing deeply from your belly and not your chest to take in more air. Incorporate yoga into your fitness routine. The practice will help you to learn how to breathe correctly. Eat within one hour of heading out for a run. Hit the ground running. Always warm up: Start with some dynamic stretches and a five-minute walk or jog to get blood pumping to your muscles before you run. Run outside when it's very cold if you're not dressed for it. This can make it hard to take in deep lungfuls of frigid air. Before going for a cold-weather run, put on a neck warmer or wrap a scarf around your neck and breathe through that. Run hunched over. It's tougher to take in deep breaths that way. Focus on maintaining good posture and proper running form.